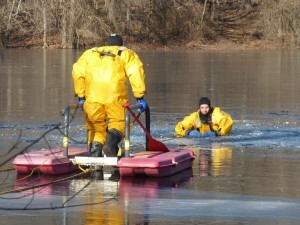 A Medford firefighter uses an ice rescue sled to make his way towards the “victim”. On Thursday, January 17th, Armstrong joined forces with our partners at Medford Fire to conduct a live ice rescue drill to prepare for unforeseen accidents. During the drill, Medford firefighters simulated an emergency ice rescue using their Rescue Alive Sled to extract a “victim” (one of Medford’s firefighters), immersed in the cold waters of Brooks Pond in the Oak Grove Cemetery in Medford. 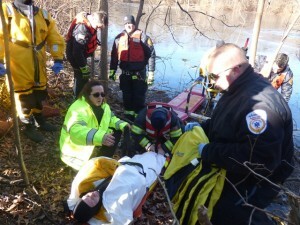 Once the “victim” was safely pulled to shore, Armstrong’s EMT Wendy Wolleager and Paramedic Mike Gilbert jumped in to assess the “victim”. Wendy and Mike immediately showed how care would be provided to prevent further heat loss by wrapping a blanket around the “victim” to start the rewarming process and minimize hypothermia. Brooks Pond was chosen as the location after a father and daughter fell through a thinning spot on the pond while they were ice skating on Sunday, January 13th, 2019. A tremendous job was done by all involved! Armstrong EMT Wendy Wolleager and Paramedic Mike Gilbert assess patient and start the warming process by wrapping the “victim” with a blanket.